Vice-President Lib Ciccolella, filling in for President Charlie Buzzard, presented Lion Gerald Sturgeon's grave marker to his daughter Tony Sturgeon Jones. There was an election of officers for 2019-2020 by secret ballot. The following officers were elected. Approximately 15 Lions and a dozen Leos collected, sorted, and delivered 28 Christmas food baskets on Saturday, December 15. 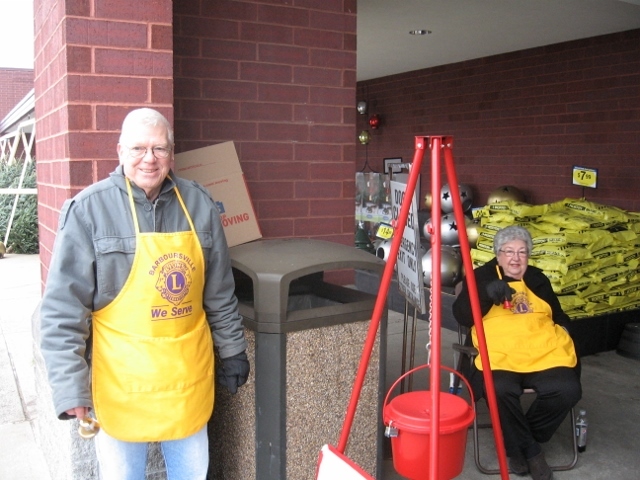 Nineteen Lions rang bells for the Salvation Army on Saturday at the Mall Walmart (both doors) they contributed forty hours of service. We raised a total of $1,209.18. Thanks for your service. Approximately 20 Lions worked this project, donating about 45 hours of service. Leos also helped work this project. A big thanks to all who worked. 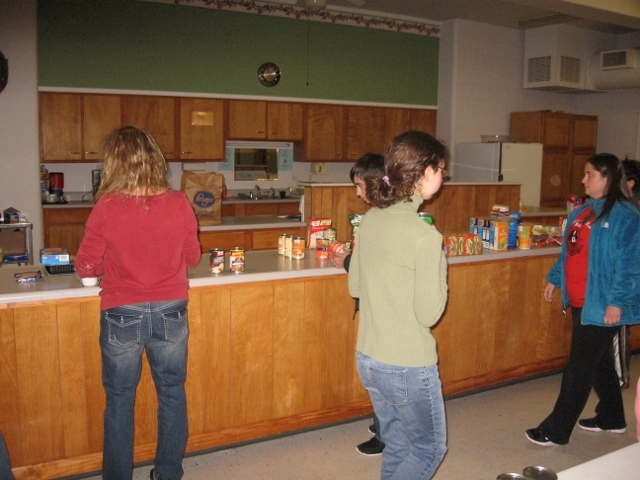 Four Lions served a brunch to about 40 seniors and several city workers. We worked approximately 13 hours. Seventeen Lions and roughly 10 Leos helped do this project. Lions worked 118 hours. We anticipate that we will make about $2,500 after expenses. Please note!!! We still have quarts and pints of apple butter still to sell. For those of you who did not work on getting pre-sales, I encourage you to stop by Roe's Insurance Agency located by the pink elephant to pick up some to sell. Pints are $5 and quarts are $8. Lion Angela Webb, who is an art teacher at Barboursville Middle School, had her art students draw peace posters for the Peace Poster Contest. She presented 15 posters on which our members voted for the top choice. The winner was Gianna Kent. Her poster will go to the district to compete. If it wins there, it will be entered in the International contest. Lion president Charlie Buzzard inducted new member Karen Vance. She is sponsored by Lion Janet Artrip. A grave marker was presented to widow Cheryl Hall for her late husband, Lion Orman Hall. She is shown here with her daughter Kelly Carter and son Kevin Hall. Midland Show Choir Performs For Us. On August 28, 11 new members had the opportunity to be inducted. At that time only eight showed to be inducted. Then on September 11 two more Lions were inducted. Finally on September 25 Amy Farley was finally inducted. This makes 11 total new Lions inducted and sponsored by Lion Tommy Turman. We hope to induct another new member, Leeland Steele following his approval by the board of directors. He will be sponsored by Lion Larry Poynter. 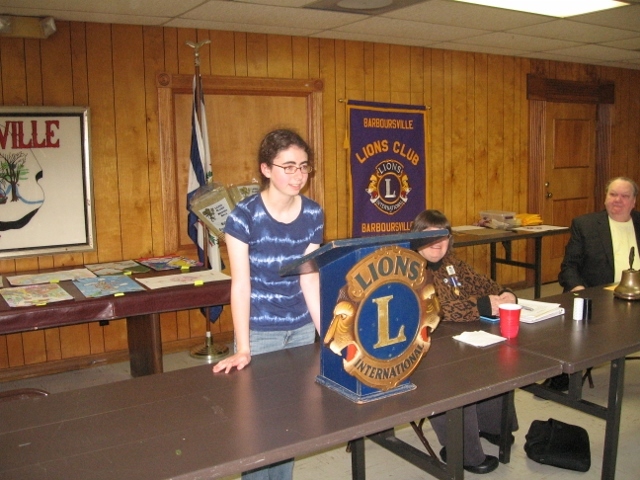 Below is a picture of new Lion Amy Farley, who was inducted by Lion president Charlie Buzzard. Sponsor Lion Tommy Turman was unable to attend. District Governor Lion Gary Pitcock made his official visit to our club on Tuesday evening, September 11. He gave a very inspiring talk about Lionism and what has become important to us. He talked about a little girl discovered with eye cancer who was given the opportunity through a Lions club to get a new artificial eye. He was well received by both Lions and Leos attending the meeting. He inducted two new members: new Lions Lowell Farley and Greg Howard. Both were sponsored by Lion Tommy Turman. Following the induction District Governor Gary took questions from those in attendance. Among things discussed was his explanation of what the boundries of a Lions club are. He also provided us with information about how to handle providing hearing aids costing only $125.00 each. He will be sending this information to our club. We wish to personally thank Governor Gary. We also wish to thank his wife, Lion Bernice Pitcock and Lion Eva Dague for attending our meeting. The following new Lions were inducted on August 28, 2018. They are from left to right: Lions Artie Adkins, Leilana (LuLu) Adkins, James Samuel, Phyllis Samuel, Shaina Carter, Kelly Carter, Becky Howard, and James Dauber. All these new Lions are sponsored by Lion Tommy Turman. They were inducted by president Charlie Buzzard. Please note that the official visit of District Governor Gary Pitcock will be on September 11. Please make an effort to be there. Eight Lions and four Leos attended the reception for First Vice-President Dr. Jung-Yul Choi from the Republic of Korea at the Holiday Inn and Suites in South Charleston on Friday, August 17. Those Lions attending were Lion Charlie Smoot, Lion Kitty Kelly-Smoot, Lion Janet Artrip, Lion Charlie Buzzard, Lion Tom Turman, and Lion Patty Turman. Leos attending were Will Turman, Olivia Turman, Levi Ellis and Amy Farley. Note in the first picture above Leo Olivia Turman and Dr. Choi are holding the May issue of Lion magazine showing Olivia and explaining about her involvement with the Braille Trail. 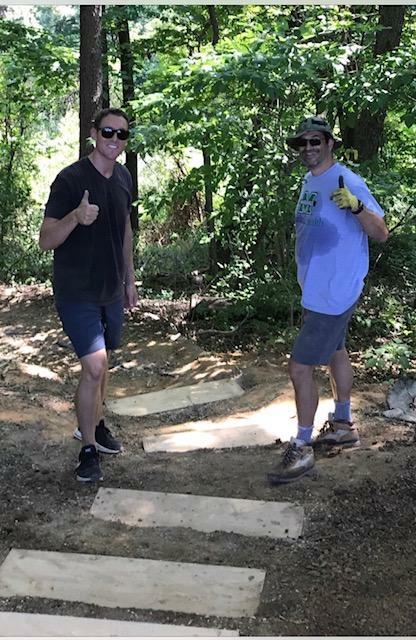 The Lions and Leos had a great work day in which much of the trail work was completed in phase one. We also sorted and counted one thousand pairs of used eyeglasses and one hundred pairs of used sunglasses. They will be taken to the recycling center in Roanoke, Virginia by Lions Charlie and Kitty Kelly-Smoot later this month. Following a nice lunch of hot dogs, hamburgers, macaroni salad, potato chips and drinks, the club meeting included a video shown to both Lions and Leos. This video, provided by the American Legion, presented an inspiring and informational story of the American flag. This video will be shown to 5th grade students next spring. The meeting concluded with a demonstration of how to fold the American flag when it is given to a spouse of a deceased veteran. All in all, we had a great day working together and enjoying the fellowship of Lions and Leos. PDG Lion John Pinkerman inducted new president Lion Charlie Buzzard. Lion Dr. Charles Francis presented the John T. Fife memorial scholarship to Lauren Fife, great granddaughter of Mr. Fife, who was a charter member of the Barboursville Lions Club. James Parsons was presented the Willis Hertig/Claud Thornburg memorial scholarship. Mr. Hertig was a former superintendent of school here in Cabell County, and Mr. Thornburg was a Cabell County Board of Education member. Both men were former Barboursville Lions Club members. Joshua Boling was awarded the Roger A. Hesson memorial scholarship. 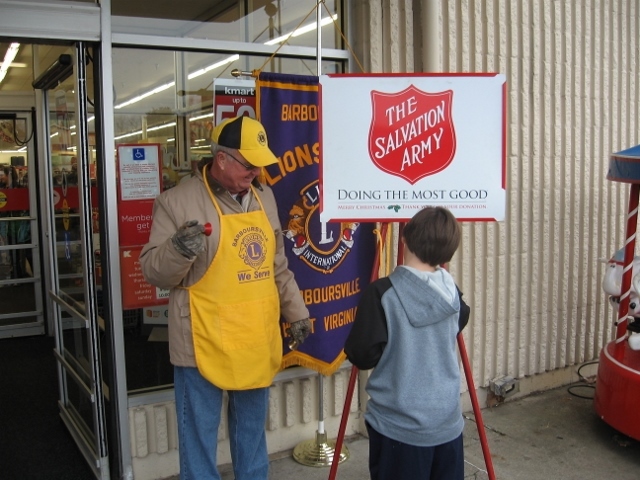 Lion Roger was the only Barboursville Lions Club member to serve as District Governor. Pictured with Josh is Lion Roger's granddaughter Lion Ashley. The 5K was a great success. This project netted the club over $6,000. In addition to the $3,000 provided by St. Mary's as our corporate sponsor, we had thirty businesses and individuals donate $100 each as sponsors. A total of 55 runners/walkers participated. Most of us were surpised at the turnout, but the weather was a great help. We appreciated the warm weather, even though we had a little rain. 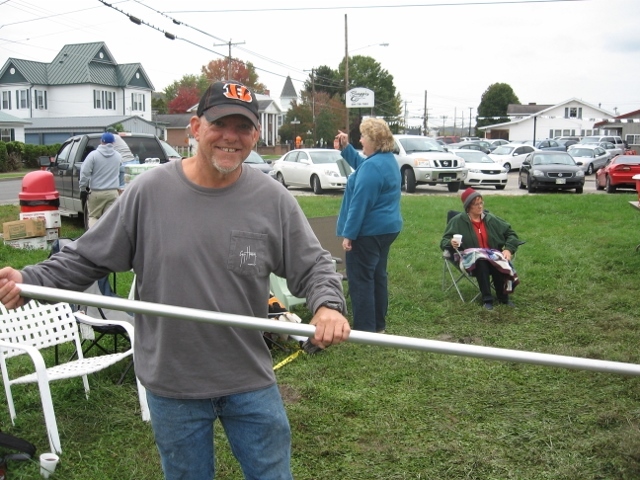 A big thanks goes to Lion Joe Weber, who chaired this project and did much of the work. Also thanks to Lion Lib Ciccolella, who got all the signs ready to be displayed and provided ice, water, and banannas for the runners/walkers. Another big thanks goes to Lion Lennie Roe who definitely got the most sponsors. Finally thanks to others workers who helped with registering runners/walkers. They included Lion Donna Cross, Lion Janet Roe, and Lion Bernice Hesson. Lion Charlie Smoot made sure the cones were put out on the course. Thanks to any other Lions who did something to help make this project a success. Ed Montgomery, shown here with his wife Marge, won the 50/50 raffle at our spring pacake breakfast and received $74, which was presented by Lion President Bernice Hesson. We celebrated the 50th Wedding Anniversary of Lions Lenny and Janet Roe. Their anniversary was on Saturday, May 12. Thanks goes to Lion Donna Cross for providing the cake. The nominating committe gave a report of officers for 2018-2019. We presented flags at six schools. They included Davis Creek Elementary, Martha Elementary, Nichols Elementary, Hite-Saunders Elementary, Salt Rock Elementary, and Village of Barboursville Elementary. We gave out a total of 285 American Flags and explained many things about the flag. The following Lions helped with this service project: Lion Lennie Roe, Lion Kitty Kelly-Smoot, Lion Lib Ciccolella, and Lion Charlie Buzzard. We wish to thank the Barboursville American Legion for providing the flags. Lion Charlie Buzzard and Lion LIb Ciccolella attended the State Convention on May 4 - 6 in Morgantown. Picutured above is third International Vice-President Haynes Townsend, who is a judge in the state of Georgia. 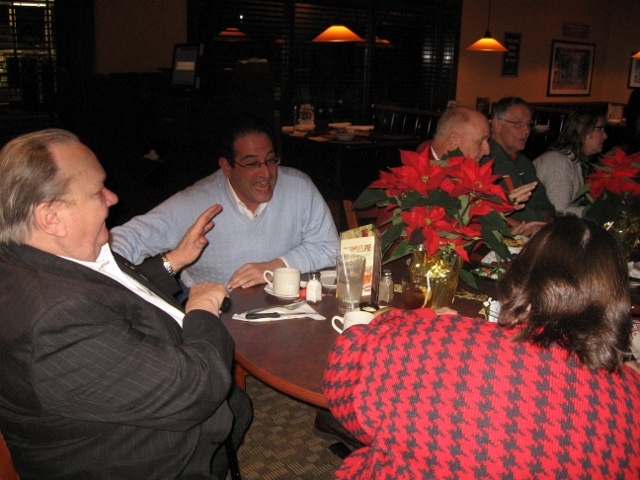 The second picture shows First Vice-District Governor Gary Pitcock and Lion Lib Ciccolella. My hope is that next year we will send at least 5 members of our club who will serve as delegates. We have a right to have one delegate for each ten members in our club. We have over fifty members. Two of our formers members, Lion Orman Hall and Lion Phil Herrold were recognized at the necroolgy service on Sunday morning. We had four special guests attend our meeting. They included District Governor LeeAnn Welch, Past District Governor John Wensyel, First Vice District Governor Gary Pitcock, and Lion Bill Syphers, who is running for Second Vice District Governor for the upcoming year 2018-2019. Secretary/treasurer Lion Janet Roe presented a check to PDG John Wensyel, who is currently the chiar of LCIF. Reminder to those who have not picked up your pancake tickets, please pick them up at Lennie Roe's Insurance Agency on Route 60 by the pink elephant. We would like for all members to try to sell at least "10" tickets. We have 53 members in the club. If everyone sold 10, we would set a record for tickets sold. The breakfast is slightly over two weeks away on April 14. PLEASE PICK UP YOUR TICKETS ASAP. 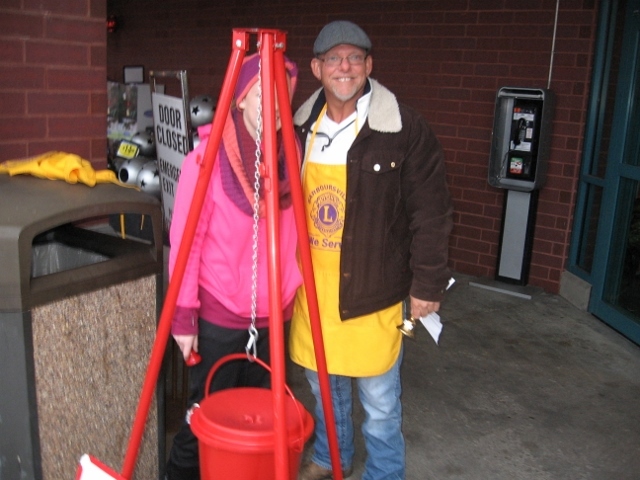 Lion Joe Weber is the chair of the Barboursville Lions Club/St. Mary's 5K, which will take place on May 19. I am encouraging members to participate in this project by getting at least one sponsor. Consider asking your doctor or dentist to donate $100 as a sponsor of this event. The following doctors and dentists have been sponsors: Dr. Charles Francis, Dr. Charles Sisson, and doctors Crews and Nibert. So please do not ask them. Also consider running or walking in this event. You can sign up on Tri-State Racer.com. President Bernice Hesson presented a grave marker to Bonnie Herrold for her late husband, Lion Phil Herrold. Bonnie's two sons, Bill and Buddy are shown here with her. 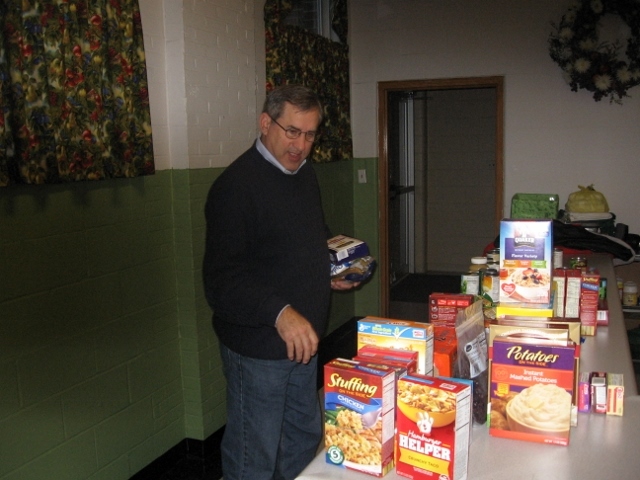 On February 13, The Barboursville Leo Club had its annual spaghetti dinner at the New Baptist Church in Huntington. The Leos fed 160 Lions and other patrons. This club is doing a great job of serving our community and area. 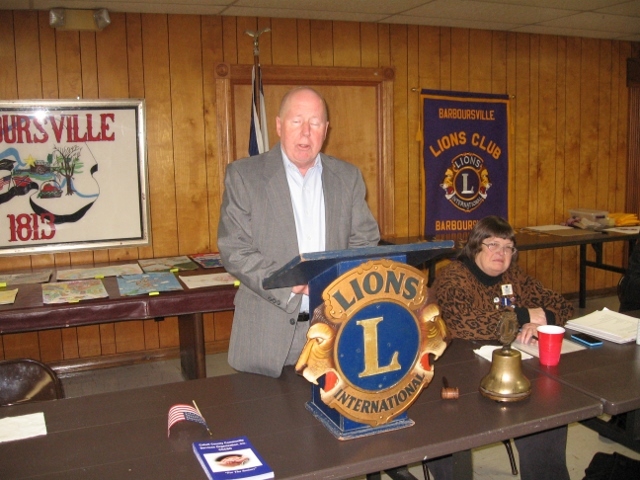 I am encouraging Lions members to attend the Barboursville Leo Club meetings on the first Sunday of each month. The next meeting will be on Sunday, March 4, at 2:00 pm. The meeting will be at the Barboursville Community Building, 721 Central Avenue. I hope to see you there. Let's support our Leos. 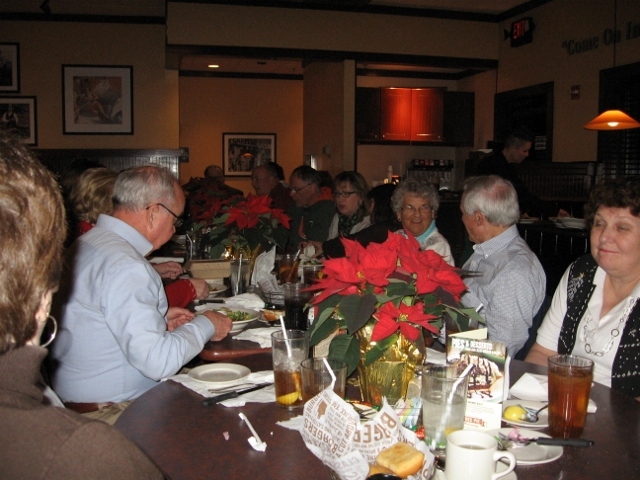 Fivty-six Lions, Leos, and guests attended the 75th anniversary celebration of the Barboursville Lions Club. Special guests included District Governor of 29-L LeeAnn Welch, Past District Governors Bob Roach and his wife Peggy, John Pinkerman, Donna Pinkerman, and Eddie Queen and his lady Kathy. Mayor Chris Tatum presented a proclamation to the club for its many years of service to the community. After a meal catered by Olive Garden, there was a program that included a history of the club presented by past president Lion Lib Ciccolella. Our club was sponsored by the Huntington Downtown Lions Club. One particular bit of interesting history was that the club tried to sell light bulbs that were inferior and lasted about as long as a flash bulb. To save the club's reputation, it got better quality bulbs to replace the inferior ones. One bit of history that many new members might not know is that the club had its own clubhouse where the Barboursville Senior Center is now located. Lion Charlie Buzzard highlighted five former presidents of the club. They included the first president, Lion W.D. Bourn, who served three years. He also served as a Vice-District Governor in 1945. The second president featured was Lion Charlie Astle, who served as a Lion for 65 years. Lion Gerald Sturgeon served as president the year that our club sponsored the Lesage Lions Club in 1972. Lion Lennie Roe served as presient in 1980-1981. He has also served as the secretary/treasurer for Lions Recreation, which was formed in the sale of the clubhouse. Lion Roger Hesson served as president more than once and also was a sight trustee on the West Virginia Sight Conservation Foundation. 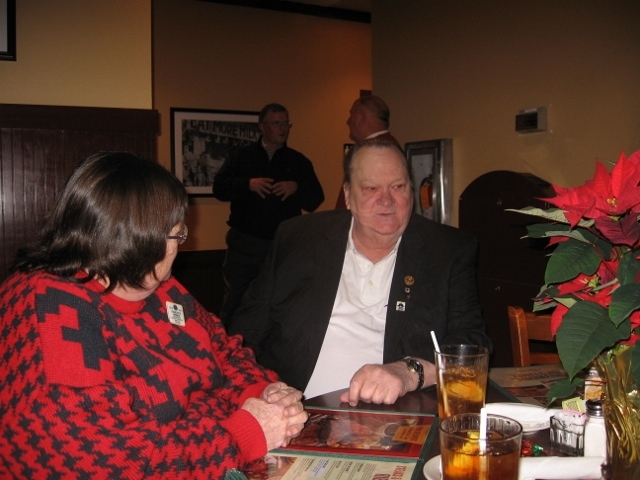 Most importantly, he was the only Barboursville Lions to serve as District Governor. Even though Lion Stephen Nash was not in attendance due to health reasons He was noted as Second Vice-District Governor who was unable to continue due to health issues. Lion Aaron Spurlock was recognized for sponsoring Lion Joe Webber. Lion Lennie Roe was presented with an International President Certificate by District Governor LeeAnn Welch. We were entertained by the Cabell Midland Show Choir, which performed their competition program. Approximately 40 singers sang and danced for a very appreciative audience. A big thanks to those who helped make this celebration a success. Past President Lib Ciccolella inducted new member Lion Angela Webb. Lion Angela has been participating in the club Peace Poster Contest for a few years as the art teacher at Barboursville Middle School. Her sponsor is Lion Charlie Buzzard. Leo Olivia Turman spoke to our club about the Leo club's project of creating a braille trail at the Barboursville Park. Olivia is to be commended for all of her hard work in securing grants for this project. A great big thanks need to go to her and her club members who are working on the project. Leo Jacob Lee also attended our meeing to inform us about the upcoming Leo spaghetti dinner at New Baptist Church in Huntington on Tuesday, February 13 beginning at 6:00 p.m. All Lions are encouraged to support this Leo project by attending the dinner. The meal is $10 for adults and $5 for children under 12. Children under three eat free. NOTE1 There will be no Lions club meeting that evening. Barboursville Lions Club's 75th Anniversary will be on Tuesday, January 23, 2018 @ 6:30 pm. This special event will be at the Barboursville Senior Center. The program will include a "HISTORY OF THE CLUB, A HIGHLIGHT OF SPECIAL PRESIDENTS, AND A HISTORY OF THE BARBOURSVILLE LEO CLUB. A MEAL IS BEING CATERED BY "OLIVE GARDEN." PRICE IS $12 All Lions and Leos are encouraged to attend. The evening will end with a musical presentation by the Cabell Midland Show Choir. Only three clubs (Barboursville, Lesage, and Downtown Huntington) attended. All three club reported on what was happening in their club. 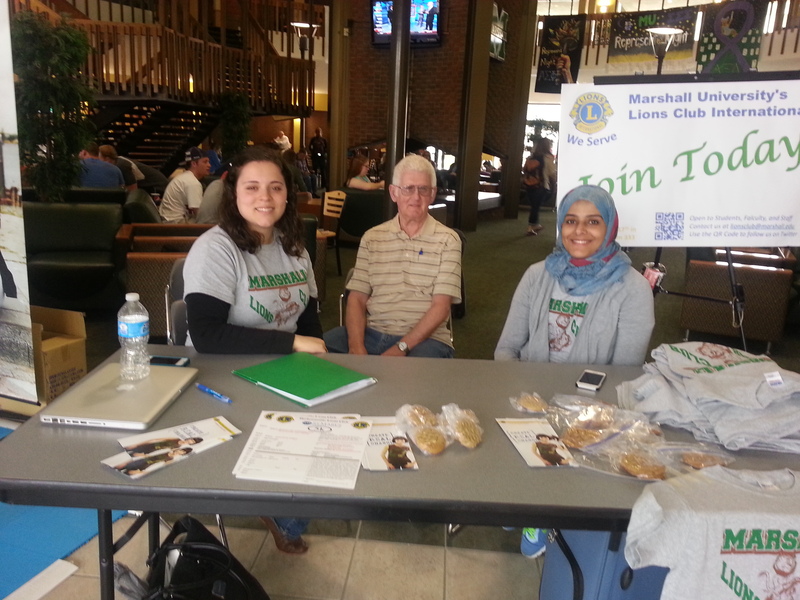 The Marshall University Lions Club sent a report even though no members from the club attended. Those attending included District Governor Lee Ann Welch. She encouraged all clubs to make an effort to attend the 95th anniversary of the Downtown Lions Club on September 29 at the Woodlands and the District 29L Conference at the Pullman Plaza Hotel on September 30. Registration is $60. If you attend, you will be reimbursed $30. Lion John Pinkerman was also in attendance. We learned that his cancer is in remission. Lion John thanked everyone for all the prayers for him. Zone Meeting on Tuesday, August 22 at the Barboursville Park (shelter #8) If you did not sign up to bring a covered dish, bring one anyway. Since we are hosting this Zone Meeting, lets make a good showing. Let's roar, Lions!!! Past District Governor and sight trustee Lion George Woodrum spoke to us this evening about money available through the sight foundation to provde eye operations for those in need and hearing aids through the Starkey "Hear Now"program. He made the point that it is the responsibility of the local club to provide applications to those in need of a hearing aid. Lion George gave Vice-President Lion Larry Poynter applications that the club can use to screen possible applicants. Lion Larry conducted the meeting since President Bernice Hesson was on vacation in Colorado. 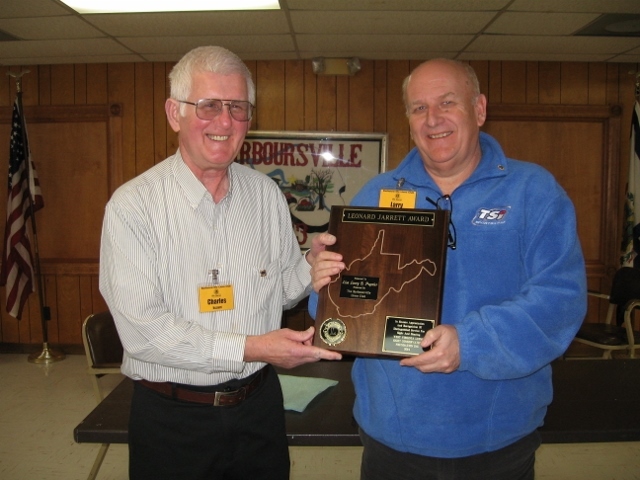 Lion President Lib Ciccolella, who served for two consecutive years from 2015 to 2017, was presented with a plaque of appreciation by past president Lion Charlie Buzzard. Lion Lib did a fantastic job as president! Paul Davis, director of the Tri-State Transit Authority, spoke to our club. He noted that the authority has been in existence since1972 and provides inexpensive rides to those who need public transportation. He noted that the general public has supported the bond levy for the authority for many years. Many elderly people take advantage of the Dial-A-Ride service. Mr. Davis was accompanied by Jennifer Woodall. Lydia Freeman was presented the John T. Fife Memorial Scholarship by scholarship chair Lion Charles Francis. Emily M. Burger was presented the Willis Hertig/Claude Thornburg Memorial Scholarship. Bethany Koontz was presented the Roger A. Hesson Memorial Scholarship. We presented a check for $500 to help finance the eighth-grade trip to Washington, D.C. Receiving the check was Abigail McNeely, Lion Chris McNeely's daughter. On June 27, 2017, we had two eighth-grade students, Abigail McNeely and Kaylee Jack, give a report on their eighth-grade trip to Washington, D.C. Lion Chris McNeely spoke on behalf of principal Brent Gerald to thank us for our contribution to the school. We did not get pictures of presentations at Village of Barboursville Elementary and Nichols Elementary. At all six schools a total of 287 flags were presented. Those who helped with the presentations were Lion Lib Ciccolella, Lion Charlie Smoot, Lion Kitty Kelly-Smoot, Lion Bernice Hesson, Lion Lennie Roe, and Lion Charlie Buzzard. The students were given information about the flag. 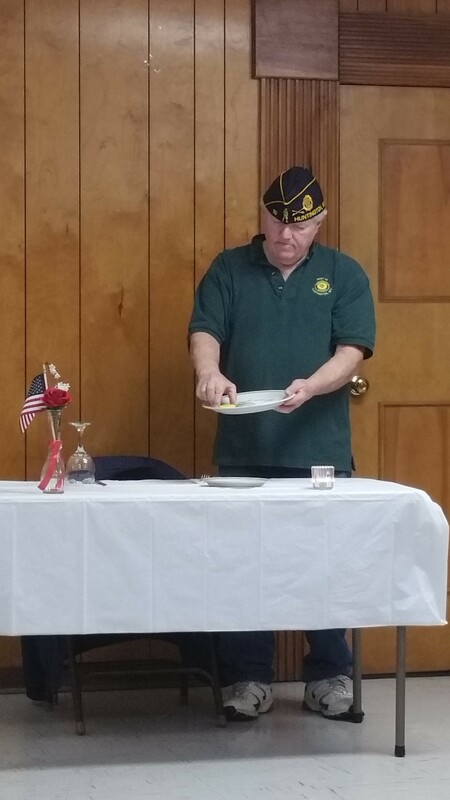 Lion Charlie Buzzard took a picture of the flag presentations to the American Legion. He thanked them for providing the flags. Sixteen Lions and 19 Leos worked this project. At this point I do not know how many we served and how much money we made. I will provide it later. President Lib Ciccolella presented a check to Lion Chris McNeely for $500 to be awarded to a needy eighth grade student at Barboursville Middle School for the opportunity to go on the eighth grade trip to Washington, D.C. Lion Chris accepted the check on behalf of principal Brett Jarrell, who was unable to attend. Lion Chris' daughter Abigail came to the meeting to explain what all the trip will entail. It includes riding to D.C. on Amtrak on the 25th of this month. They will be there two nights and three days, taking in many of the historic sites including Arlington National Cemetery, where they will observe the changing of the guard. They will view many of the national monuments and spend time at the Smithsonian. Abigail said that most of the sightseeing will be done at night. 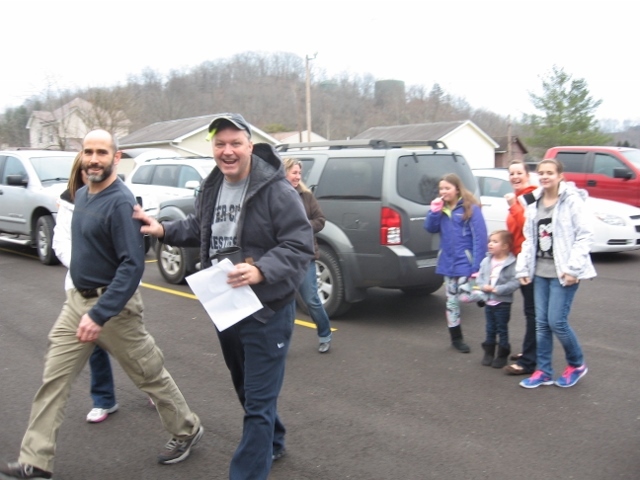 Our club donated $200 to Special Olympics students at the Village of Barboursville Elementary. They sent us a thank-you card for our support of them. 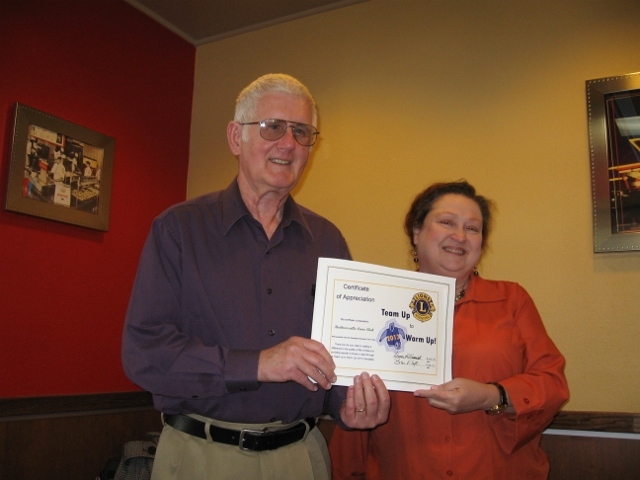 Past President Lion Charlie Buzzard swore in our latest new member Sharon McKenna. Lion Sharon was sponsored by her husband, Lion Jack McKenna. Lion Deana White and her two children, Leo Ellie White and Leo Josh White did a presentation on the Greenbank Observatory. Both Leos were winners of a contest to promote the observatory, with Leo Ellie coming in second and Leo Josh coming in first. Leo club members are planning to do an overnight trip to the observatory to gain educational experiences provided by it. We Lions club members are encouraged to show support for the Greenbank Observatory. Lion Deana will be sending some links to use in our support. Catherine Mitts, BSN, RN, program coordinator of diabetes education at the Joslin Diabetes Center, was our guest speaker. She informed us of what those with diabetes need to know such as how often to check blood sugar, what our blood sugar level should be, and how to keep those levels where they should be. Three of our members, Lion Lib Ciccolella, Lion Bernice Hesson, and Lion Charlie Buzzard attended the conference in Parkersburg. We were entertained by a singing group of young people from the Parkersburg area. In the afternoon we attended a seminar. That evening we heard a keynote speech by International Director Robert Libin from Rego Park, New York. Our club donated $3,750 in the parade of checks. Our club should be very proud of this in that we were third in donations behind Wheeling (roughly $13, 000 and Parkersburg $3,950. On February 14, 2017, past president Lion Charlie Buzzard swore in our latest new member, Marie Majdalany. Her sponsor, Lion Tommy Turman, was unable to attend her swearing in. In his stead, President Lib Ciccolella pinned Marie. Lion Charlie Smoot and Lion Kitty Kelly-Smoot, members of American Legion Post #16, presented a program in honor and memory of those that gave THE ULTIMATE SACRIFICE. On February 3, 1943, a German submarine torpedoed the USAT Dorchester, carrying 902 servicemen, merchant seaman, and civilian workers off the coast of Greenland. The Dorchester sank within thirty minutes, taking a total of 672 men to their deaths. Among the casualties were four Army Chaplains who gave up their life vests and stayed behind to comfort and calm those who could not be saved. Arm in arm, they joined in prayer as the ship disappeared into the frigid waters of the North Atlantic. Thanks to Lion Charlie and Lion Kitty for this very moving and inspirational presentation. Five new members were inducted by Past District Governor John Pinkerman. From left to right, Lion Kelli Sobonya sponsored T-Ann See and Toney Stroud. Rachel-Miles Hoops, Scott White, and Jack McKenna were sponsored by Lion Tommy Turman. Pictured above is Terri Keenan. Please excuse me for not getting the picture upright. I tried for an hour, but could not get it in the correct position. Terri received an operation that saved her sight. She had to go to Morgantown to have surgery and follow-up visits. For those who don't know, we give a thousand dollars each year to support the Leonard Jarrett sight progam in West Virginia. Because of this, Terri was able to have transportation, housing and all surgery costs paid through the Leonard Jarrett program. 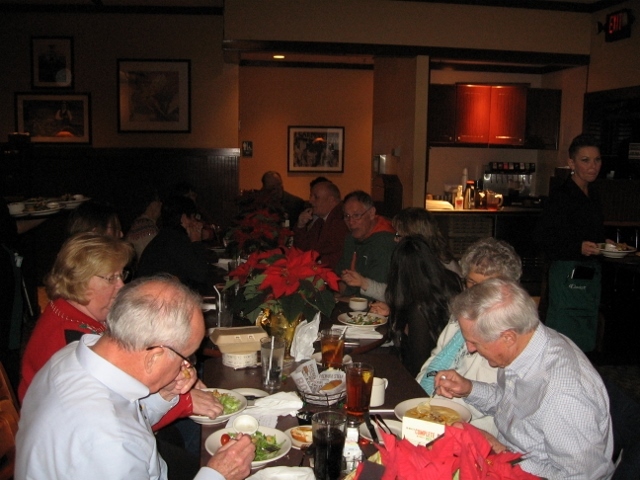 Twenty Lions and five guests had a great time of fun and fellowship. Thanks to Lion Renee' Burcham and her daughter, Leo Jessica Burcham, for decorating and conducting the "Dirty Santa" gift exchange. Lion Lennie Roe and Ray Merritt started the day. 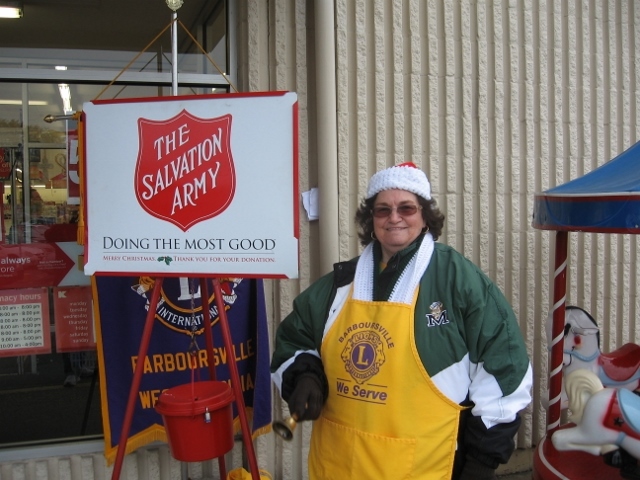 Lions Bernice Hesson and Donna Cross endured a cold two hours ringing the bells. Lions Janet Artrip and Janet Roe endured the cold with Lion Janet Artrip getting a cup of coffee to warm her up. I did not get a picture of Lion Kitty Kelly Smoot, Lion Charlie Smoot, Lion Christine Hall, and Lion Charlie Buzzard. All of these people are to be commended for working two-hour shifts on a very cold day. At this time I do not know how much money we collected. I do know that the kettle was full at the end of the day. Approximately 20 Lions and 20 Leos worked this breakfast on December 3, 2016. The latest word is that we made approximately $1,100. We also sold brooms and apple butter. We still have both available. 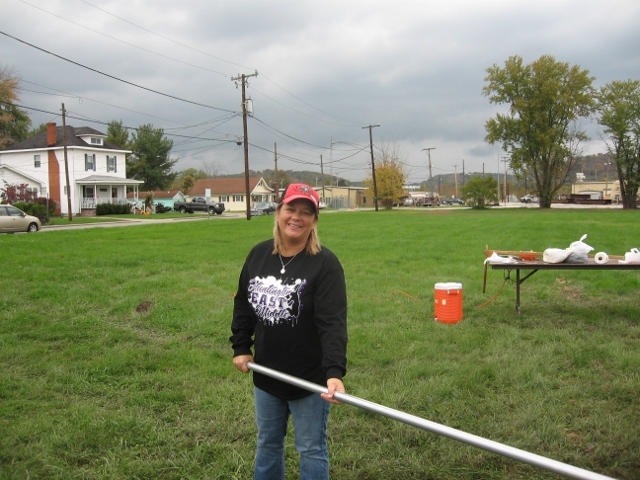 Just see Lion Janet Roe at the Roe Insurance Agency if you are interested in purchasing either a broom or some apple butter. Both regular and no-sugar-added apple butter is still available for $8 per quart. Twenty-two Lions and Leos spent a day in Clendenin helping to tear out water logged floor and to put up new wallboard. Our presidnet, Lion Lib Ciccolella, presented a check for $1,200 to the Clendenin Ministerial Association to buy food to replenish the food pantry. Twenty-two Lions and 20 Leos worked the breakfast. We anticipate that we made approximately $2,400. Half of this will go for flood relief in Clendenin. The money will go to support the food pantries at churches in Clendenin. Thanks to all who worked this project. Former Lion Jack Mckenna spoke to us about the Lions Club Field, explaining to us all the improvement that had been made over the years. He continues to help with the upkeep of the field by mowing it twice a week. For all that he has done for the Lions, he was presented with the Melvin Jones Award. He is truly deserving of this award. First Vice-District Governor Lion LeeAnn Welch attended our meeting. She is shown to the left of Jack McKenna. Lion Daryl White, who served as our Lion Tamer last year, was presented with the Leonard Jarrett Award. Lion Daryl has worked many Lions projects and Leo projects. Congratulations, Lion Daryl. We inducted new member Joseph Weber. Pictured to his right is his sponsor Aaron Spurlock. Lion Tom Turman, our Membership Chair, was presented with a Builder Key Pin for getting new members into our club. These Lions received attendance pins for the year 2015-2016. Three $1,000 scholarships were awarded to Cabell Midland High School graduates. Zachary Miller, the John T. Fife scholarship; Mary Morrison, the Willis Hertig/Claude Thornburg scholarship; and Collin Lee, the Roger A. Hesson scholarship. Collin Lee presented scholarship by Lion Bernice Hesson. As of today (June 29, 2016) we have made $4,325.25 There are a few T-Sponsors yet to be turned in. We anticipate making at least $5,000. Thanks to those of you who got T-Sponsors and door prizes; also thanks to those of you who worked the golf scramble. We made $2,992. Thanks to all of you who worked this project. 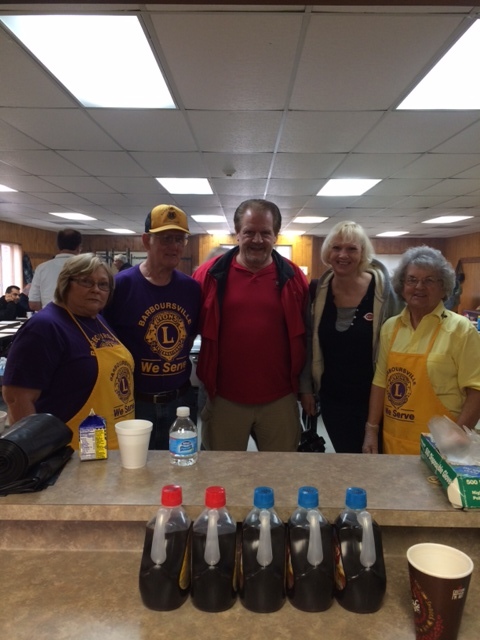 Barboursville Lions Club/St. Mary's 5K is our next project on April 23. It will be held at Barboursville Park. We encourage you to register and participate in the 5K. Cost is $20 if you register by April 15. If you have a team of 5, the cost is $15 per person. Barboursville Lions Club Charlity Golf Scramble at Orchard Hills on Saturday, June 4. Information about the scramble will be sent to club members soon. If you play golf, we encourage you to get a team of "four" together. Cost for the team is $200 or $50 per team member. Twenty-two Lions and 18 Leos worked the breakfast. We made about $1500 after expenses. Mayor Chris Tatum was our guest speaker. He spoke to us about the fact that the swimming pool will not be open this summer. Those wishing to swim will have to do so at the Kennedy Center pool on Route 2. He spoke extensively about the development of the Tannyard Yard complex and some of the businesses that will be there. This development should be completed in the next year. 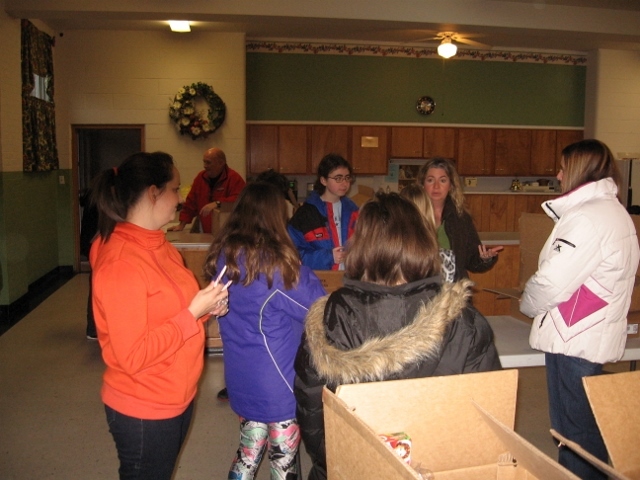 The Barboursville Leo Club had a very successful spaghetti dinner in February. They raised about $1500. Since November 11 is Veterans Day, two of our Lions, Lion Charlie Smoot and his wife Lion Kitty Smoot presented a program that emphasized the importance of never forgetting our veterans who gave their lives or are missing in action. Lion Charlie is a Viet Nam veteran. Other veterans in attendance were Lion Lennie Roe, Lion David Massie, and Lion Steve Nash. Members in attendance voted on their choice of the winner for the Peace Poster Contest. Grant Herrenkohl is the winner. His poster will be sent to District chair Ellen Saunders, and it will be in competition with other Peace Poster winners in the district. If it wins in the district, it will be entered into the International competition. Lion Steve Nash and Lion Martha Ferguson were presented a green and white carnation by president Lib in rememberance of their brother Barry Nash, who died in the Marshall plane crash on November 14, 1970. Please check the calendar for events this month and in December. Please note that there will not be a meeting on November 24. Lion president Lib Ciccolella presented a check to Chris Tatum, who won the 50/50 drawing at our Fallfest Pancake Breakfast. Mayor Tautm donated his earnings from the drawing. Lions Charlie and Betty Buzzard were presented with an anniversary cake and a boquet of flowers celebrating their Golden Wedding Anniversary. They also received a card signed by members in attendance. They wish to thank club members for celebrating with them. A big thank you to Lion Mary Ann Massie for a very successful Ice Cream Social on October 5. We really owe a big thanks to her daughter as well as Lion David Massie. The home made ice cream was really delicious, and the cake walk was a lot of fun. The Bill Crews family was presented with a grave marker for Lion Bill. 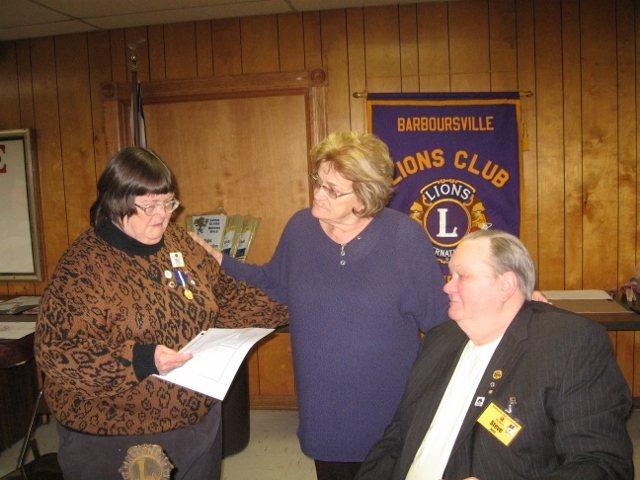 Lion Delores Rozzi was inducted by past president Lion Charlie Buzzard. Lion Judy Deer is her sponsor. Sam Morrison, shown here in this picture, told us the story of the bronze lion sitting on the table behind him. The Morrison family originated in Ireland. They placed the Lion into the International Art Expo in Paris, France in 1900. It won first place. The man that made the Lion statue was the last man to attempt to fly around the world. Mr. Morrison said that the man failed more than once in his attempts. Lion Chris McNeely and Lion Larry Poynter made some fabulous pancakes. Lion Charlie Buzzard performed the induction of five new members at our meeting. From left to right is Lions Charlie Buzzard and new members Aaron Spurlock, Ashley Ripley, Lisa McClure, Jeremy Clem, and Tamara Toney. Lion Tommy Turman, their sponsor, is standing next to Tamara. President Lib Ciccolella prented Lion Bernice Hesson with a membership advancement pin . 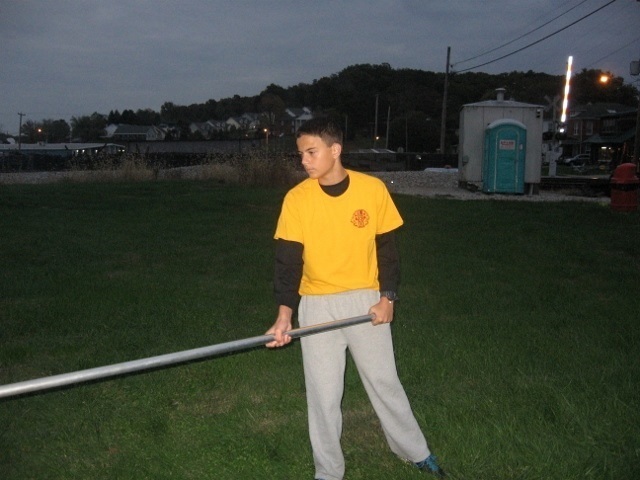 September 26 - Leo Kickball Tournament. We need Lions to serve as umpires or work the concession all day from 9:00 a.m. until 7:00 p.m. You can simply work a shift of a couple of hours. The Leos would really appreciate our help and support. Leo Ty Spurlock spoke to our club on our August 11 meeting about the upcoming Barboursville Leo Club Kickball Tournament. Ty said that there will be five teams consisting of 8 to 13 players on each team. Each team member pays an entry fee of $10 and brings a can of food to be given to the Cabell Midland Food Pantry. The tournament will take place on Saturday, September 26, at two of the softball fields at the Barboursville Park. The Leos would like for the Lions to operate the concession on that day and provide at least four umpires for the games to be played. Two Leos attended the camp in June. They came to our meeting on July 14 to talk about their camp experiences. Hannah Bledsoe spoke to the club about her experience at Camp Horseshoe. She said that she had a great time and learned much at the camp. Will Turman also spoke about his experience at the camp. Both Leos gained leadership skills by their attending Camp Horseshoe. Four Cabell Midland seniors received a $1,000 scholarship. Katherine Watson received the Willis Hertig Memorial Scholarship. Mary Ann Ball received the John T. Fife Memorial Scholarship. Kelsey Offutt received the Roger Hesson Memorial Scholarship. Second Vice-District Governor Lion Charlotte Henson presented Secretary Lion Janet Roe the "Certificate of Excellence Award" for completing all secretarial reports for the year. Lion Peachie Childers received the Leonard Jarrett Award for her outstanding service this year. The award was presented by Second Vice-District Governor Lion Charlotte Henson. 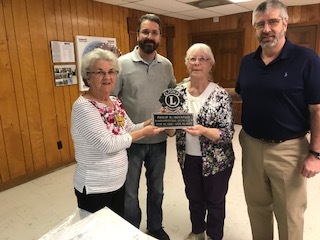 Past District Governor Lion Jim McMillian presented "The Leo Club Advisor Outstanding Service Award" to Lion Charlie Buzzard (accepting on his behalf was his wife, Lion Betty Buzzard), Lion Tom Turman, and Lion Renee' Burcham. Barboursville Leo Club president Jessica Burcham received the "100% Leo Club President's Award" for the club meeting all of the requirements to receive the award. The Leos are to be commended for all they have accomplished this year. District Governor Karen Hall-Dundas presented Lion Charlie Buzzard with a patch for the year 2012-2013 to be put on our club banner. This patch was given for our club excellence that year. Lion Charlie was also presented with the President's Excellence Pin for the year 2012-2013. The District Governor also presented president Steve Nash with the District Governor's Award for our club taking in 18 new members this year. We wish to thank Lion Tom Turman for getting most of these new members. Teresa Boyd, director of volunteer services at the Huntington VA, was our guest speaker. She had many nice things to say about the VA and the services that volunteers provide there. She encouraged all of us to consider becoming a volunteer. She was given an application by president Steve Nash; she was also given a certificate for coming to speak to our club. 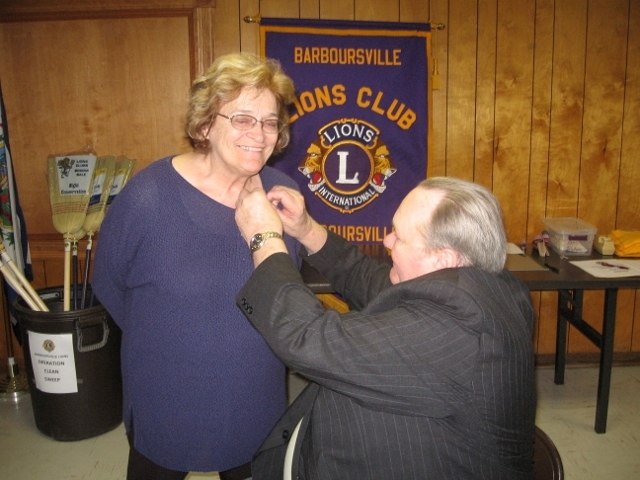 Lion Steve feels confident that Teresa will be joining the Barboursville Lions Club. Final plans were made to have another successful Barboursville Lions Club Charity Golf Scramble this coming Saturday, June 13. 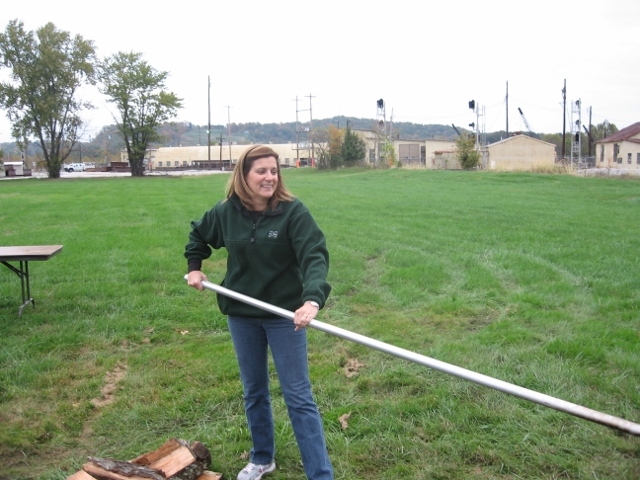 The Village of Barboursville Elementary was given 222 spruce seedlings. All fourth and fifth grade students will take a seedling home to plant. 93 fourth and fifth grade students at Nichols elementary were given a spruce seedling to take home and plant. Martha Elementary was presented with 89 seedlings to fourth and fifth grade students to take home and plant. At Davis Creek Elementary 85 students in the fourth and fifth grade were given a seedling to take home and plant. A big thanks goes to Lion Judy Deer, who helped secure these seedling at no cost to us through the support of Agricultural Commissioner Walt Helmick. Thanks to the following Barboursville Lions who worked this project: Bernice Hesson, Deana White, Peachie Childers, Lib Ciccolella, and Charlie Buzzard. The primary focus of the meeting was the Barboursville Lions Club Charity Golf Scramble, which will be held on Saturday, June 13, 2015. Lion Larry Poynter, the chair for this project, identified those Lions who will get T-SPONSORS and those who will get DOOR PRIZES. Leo Ellie White informed the Lions that the Leos planned to check with the Village of Barboursville to see if there could be some tree seedlings planted in the city. Leo Ellie also updated our club on a project that the Leos plan to do. They are planning to make stuffed animals to donate to either Cabell Huntington Childrens' Hospital, the Huntington City Mission, or any other organization that cares for children. Seven Barboursville Lions Club members attended the State Convention in Charleston. They included President Steve Nash, Lion Charlie Smoot and his wife Lion Kitty Smoot. Shown at the same table in the first two pictures are Lions Charlie Buzzard and Betty Buzzard. Shown at a separate table at the banquet on Saturday evening are Lions Judy Deer and Janet Artrip. On Sunday morning we attended the district breakfast where Lion Janet Artrip received a gift from District Governor Karen Hall-Dundas. In the final picture is shown International Director Jack Epperson, who was the featured speaker at the banquet on Saturday evening. He stopped by our breakfast before heading for home in Nevada. Members from our club and other clubs in the Zone collected about a thousand pounds of dog food and cat food that was taken to the animal shelter. Thanks to all who participated. Dr. Shirley Neitch was our guest speaker. She gave us a very clear understanding of dementia, and explained that alzheimers is a type of dementia. She further explained the differences between what is normal aging and what could be dementia. She talked about treatments for the disease and gave recommendations for dealing with it. 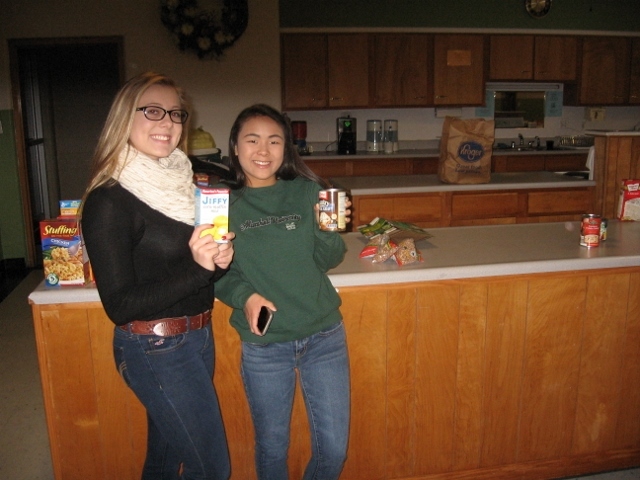 Thirteen Leos and a number of Lions helped put the food baskets together on Friday, December 19. We wish to thank the students at The Village of Barboursville Elementary and Davis Creek Elementary for collecting over 1500 non-perishable food items. 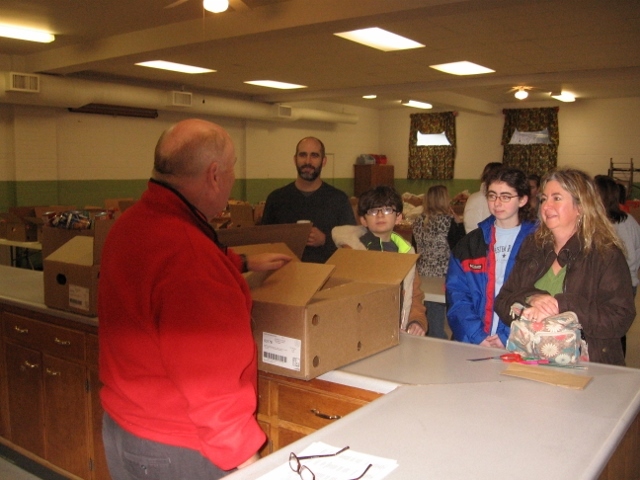 Twenty-five food baskets were delivered on Saturday morning, December 20. Thanks to all the Leos and Lions who worked on this project. We had a successful day ringing bells for the Salvation Army. We raised $546.09 at K-Mart and $477.43 at Kroger. The grand total was $1,023.52 Thanks to everyone who worked. Note the bell ringers below. I missed getting a picture of Lion Janet Roe, Lion Stacy Layne, Lion Ainslie McKinney, Lion Patrick Francis, Lion Betty Buzzard, and Lion Charlie Buzzard. We had a tremendous turnout of 41 Lions and guests. Several veterans (members and invited guests) were presented an American flag in support of all they have done to serve their country. Chuck Ricks from Cabell County Community Services Organization (CCCSO) was our guest speaker. He spoke about what this organization does for the community. Those in attendance were given a brochure detailing all the services that the organization provides. 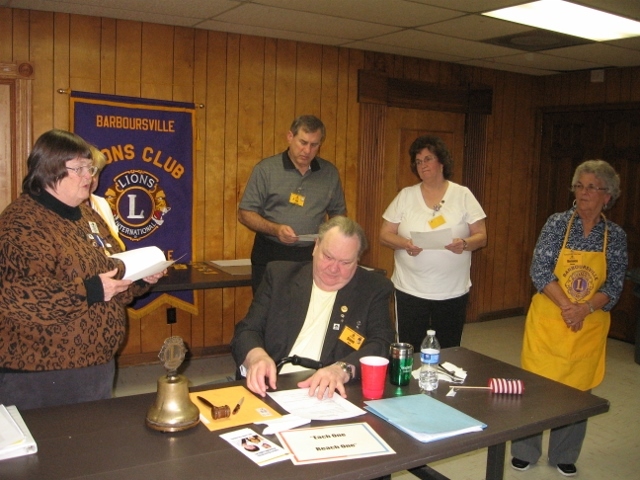 Second Vice-District Governor Lion Charlotte Henson inducted a new member, Lion Sandra Merritt. Lion Sandra was pinned by her brother, president Steve Nash, who will be her sponsor. Second Vice-District Governor Lion Charlotte Henson presented chevrons for years of service. Ellie White, the Barboursville Leo Club secretary, talked to the club about what has been happening in the club, including meetings and developing a calendar for the year. At the last meeting at Billy Bob's there were 17 Leos and six Lions who attended. She said that the club is planning to work at the City Mission during Thanksgiving week helping to prepare food and serve meals. Club members are also planning to help at the Breakfast With Santa on December 6 at the Barboursville Senior Center. Leo will also help the Lions on Salvation Army Day on December 13. 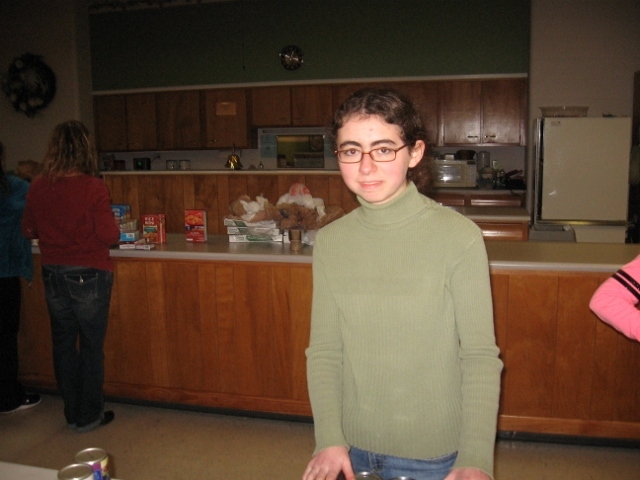 The club, she said, is also planning a trip to Co-Sci in Columbus this winter or next spring. It was a very busy evening with those in attendance voting on the Peace Poster Contest winner. Note the posters lying on the table in the background. Our guest speaker was Natural Resources Police Officer Clarence Nicely. He said that up till three years ago he was called a Game Warden. Now he has the authority to stop speeders, etc. He answered many of our questions. He made me understand that I no longer have to pay for a license or a trout stamp to fish since I am over 65 years of age. We hope to see Clarence become one of us. 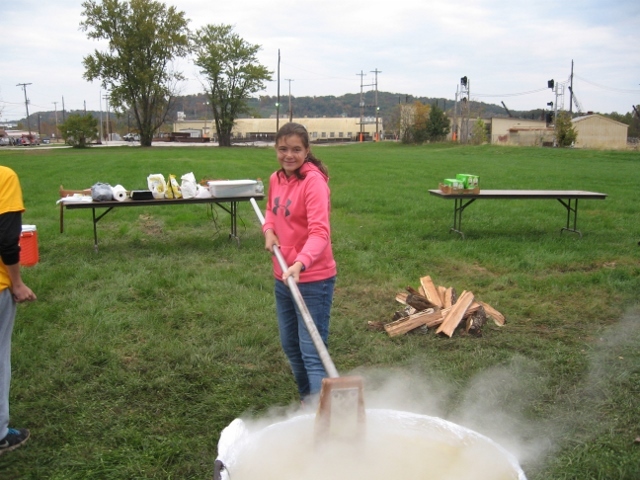 The Turman family (Lion Tom and wife Lion Patty and their two Leo children, Will and Olivia, helped stir apple butter. The Bledsoe's, Lion Patrick and wife Lion Diana and their daughter Leo Hannah helped stir. Lion Kitty Kelly-Smoot helped Lion Tennyson Thornberry and other Lions and Leos can the apple butter. Thanks to all the LIons and Leos who helped make this project successful. A big thanks to Lion Bernie Hesson for serving as the chair of this project. Jessica Burcham, president of the Barboursville Leo Club, came to our meeting to talk about what the Leo club will be doing during 2014-2015. The club will be working with Lions on our projects as well as doing some of their own projects. At the first meeting of each month a Leo will give an update about their activities. Lion Bernice Hesson is the chair for the apple butter project. We will be making apple butter this Saturday from 5 a.m. until we finish. We will be making two kettles. One will be regular and one will be surgar free. We encourage all Lions to help pitch in to make this project a success. If you have orders for apple butter, you must pay Lion Bernie for what you take as you pick it up on Saturday evening. To the right of president Stephen Nash are District Governor Karen Hall-Dundas, First Vice-District Governor E. Duane White, Second Vice-District Governor Charlotte Henson, Past District Governor Jim McMillon, Past District Governor Eddie Queen, Lion Kathy Stephenson, and (not shown) Past District Governor Donna Pinkerman. Seventeen new members (WOW!) were inducted by First Vice-District Governor Duane White. Governor White, who had attended the Leader Dog school, had each member wear a blindfold to get a better understanding of what it is like to be blind. Next the governor had each new member turn around facing him to be sworn in. Lion Janet Artrip was sworn in as membership chair by District Governor Karen Hall-Dundas. Lion Donna Cross was given her ten-year pin by Governor Karen Hall-Dundas. Our guest speaker was Mike Zaneski, who was formerly a member of our club. He spoke to us about the Al-Anon program, which provides strength and hope for families and friends dealing with family members facing alcoholism or drug addiction. In light of the extreme drug problem in our area, this was a very timely presentation. Nineteen members and six guests were in attendance. September 8 - Zone Meeting at Lesage Lions Club clubhouse at 6:30 p.m.
September 13 - officer training at Golden Corral in Cross Lanes from 9:30 a.m. until 12:00 p.m.
September 18 - catch the trolley at K-Mart by 5:00 p.m.
Past District Governors Donna Pinkerman and her daughter Kris Pinkerman attended our meeting. Lion Donna is the zone chair for our zone this year. In addition to them, there were about ten other guests at the meeting. Most of them plan to join our club. PDG Kris Pinkerman presented Lion Renee' Burcham with a Lion Key for getting new members. District Governor Karen Hall-Dundas made her official visit to our club, bringing greetings from International President Joe Preston. She indicated that his motto for this year is "Strengthen the PRIDE." His emphasis this year is on increasing membership. To go along with this, the District Governor has a motto: MEOW. "M' stands for mentoring. "E" stands for encourage. "O" stands for outreach. And "W" stands for WORK. So, let's all MEOW! 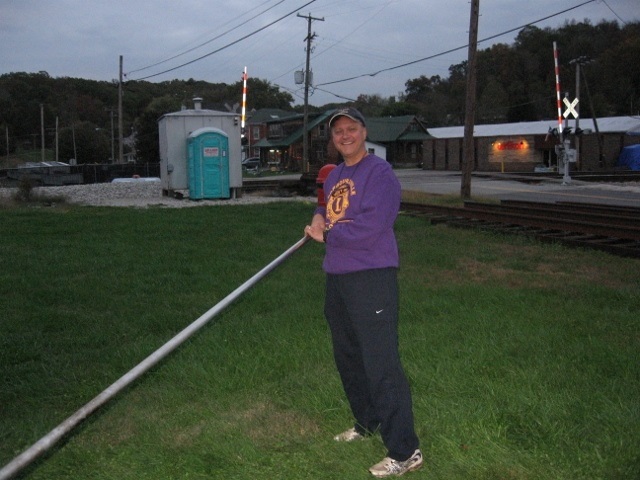 The District Governor wants each club in the district to have a net increase of two by the end of the year; however, club president Steve Nash wants the Barboursville Lions Club to have a net increase of ten by the end of the year. Second Vice-District Governor Charlotte Henson and District Governor Karen Hall-Dundas display the quilt that is being raffled off to support the West Virginia Sight Conservation Foundation. The quilt was made by Lion Charlotte's mother. Our club purchased a hundred dollars worth of tickets in addition to tickets purchased by individual members. The drawing for the quilt will be on September 27 at the District 29-O Fall Conference at Milton Baptist Church. If our club wins the raffle, it will be given that quilt. If our club sells the most tickets, we will receive another quilt that we can use to raffle off to raise additional funds. Tail Twister Lion Lennie Roe had a little fun with our president by cutting off his tie. It was all in good fun! District Governor Karen Hall-Dundas pictured here with our club president, Lion Steve Nash. Barboursville Leo Club president Emily Kinner was presented with a Completion of Service Award and a check by Leo advisor Lion Charlie Buzzard. Emily will be attending Marshall University this fall studying for a degree in broadcast journalism. Our hope is that she will join the Marshall University Lions Club. New president Lion Steve Nash revealed project chairs for projects from now until the end of 2014. Let's all get behind Lion Steve to make his year as president a great success. Scholarship chair Lion Sherri Vance presents the Roger A. Hesson Memorial Scholarship check to Jordan Garcia. Lion Lib Ciccolella presents the John Fife Memorial Scholarship check to Anna Sheils. Lion Julie Sheils presents the Willis Hertig/Claud Thornburg Memorial Scholarship check to Taylor Risinger. Past District Governor Lion Eddie Queen inducted new Lion Donna Fkih. Her sponsor is Lion Judy Deer. Lion Eddie also inducted all the new officers for 2014-2015. Patricia Perry, executive director, of the new Village of Riverview Senior Living Community located at 1356 Riverview Drive in Barboursville, was our guest speaker. The facility, which is still under construction, will be open to new residents in September. It contains fifty-four units, and includes a sun room and a great room for residents and their families to enjoy. There will be home cooked meals provided by a professional chef. Patricia stated that their mission is to provide a home-like setting which injects warmth, love, and humor into the lives of each and every resident and their families. Fifteen Lions were in attendance. Lion Larry Poynter reported that the Barboursville Lions Club Charity Golf Scramble was a great success with the club making over five thousand dollars that will help provide scholarships, eye exams, eyeglasses, etc. The next club meeting on June 24 will be special. At that meeting we will be giving three one thousand dollar scholarships to deserving Cabell Midland High School students. We will also be inducting our new officers for 2014-2015. For those of you who have not been attending club meetings, we encourage you to make a special effort to attend. A total of four teams (16 golfers) participated in the scramble. Some of the players from years past were out of town or had other commitments. However, through the efforts of those who got tee sponsors, we were able to raise approximately five thousand dollars. A big thanks to everyone who helped get tee sponsors. I especially want to thank Lion Lennie Roe and Lion Larry Poynter for making this project a great success. The following article will appear in The Cabell Standard. On Saturday, May 31, 2014, the Barboursville Lions Club held its annual charity golf scramble at Orchard Hills Golf Course in Barboursville. It was a great success on a perfectly beautiful day. The club wishes to thank all the tee sponsors and door prize contributors for their support. 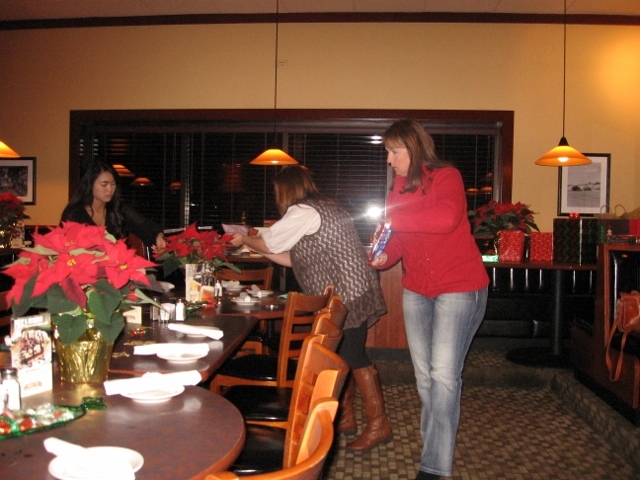 With their generosity the club was able to raise nearly five thousand dollars. This project, along with several other projects put on by the club, makes it possible for the club to support many needs. More than half of the money raised by the club stays in this local area. One hundred percent of money raised goes back into the community on the local, state, national, and international level. 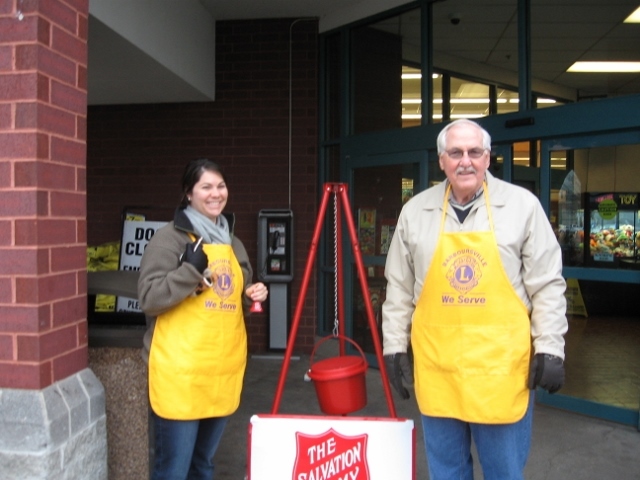 Our club continues to seek out people in our community who have a passion for service. We invite you to attend one of our meetings. We meet on the second and fourth Tuesday of each month at 6:30 p.m. at the Barboursville Community Center, 721 Central Avenue in Barboursville. 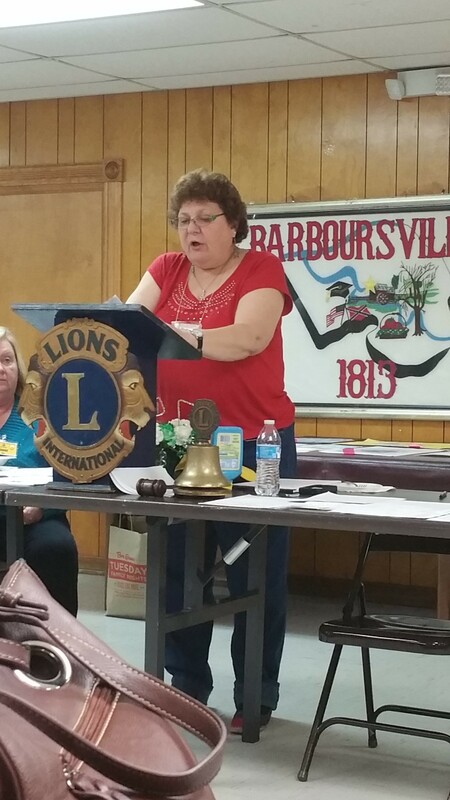 Lion Barbara Danford, who is an audiologist working with Dr. Touma, was our speaker at our meeting on May 27, 2014. She spoke to us about the "Hear Now Program." This is a program provided by the Starkey Hearing Foundation to provide assistance to those in need. Lion Barb would like to donate one day a month to meet and screen applicants that have been approved to use her services. The screening could be done at The Barboursville Community Center with the approval of the city of Barboursville. Our club could provide financial assistance in this project. Great news!!! We have raised over $5,000 in tee sponsorships for our charity golf scramble this Saturday, May 31, at Orchard Hills Golf Course. I wish to express my thanks to all of you who helped get tee sponsors and door prize donors. Five of our members attended the Multiple District 29 State Convention at Stonewall Jackson Resort April 25-27. Those attending were Lion Charlie Buzzard, Lion Janet Artrip, Lion Lib Ciccolella, Lion Judy Deer, and Lion Steve Nash. Redistricting from four districts to three passed. If approved by LCI, this will go into effect in 2015-2016. Dues will increase from $9 to $12 per year starting in 2014-2015. Our new District Governor is Lion Karen Hall-Dundas from the Lesage Lions Club; First Vice-District Governor is Lion Duane White from the South Charleston Lions Club; Second Vice-District Governor is Lion Charlotte Henson from the Cross Lanes Lions Club. Below are some pics from the convention. I took a picture of a Lion who had a Leaderdog. The last pic is International Director PDG Bob Corlew of Milton, Tennessee. At our April 22 meeting we took in three new members. They are (L-R) Lion Jimmy Osborne, Lion Barbara Danford, and Lion Kelli Sobonya. Lion Jimmy Osborne was pinned by his sponsor, Lion Charlie Buzzard; Lion Barbara Danford was pinned by her sponsor, Lion Bernie Hesson; and Lion Kelli Sobonya was pinned by her sponsor, Lion Judy Deer. Our club now has 44 members, which means we are minus 1 for the year. Hopefully we will induct a least two more before the end of the year. Nichols Elementary,Davis Creek Elementary,Salt Rock Elementary, Village of Barboursville Elementary, and Martha Elementary. Approximately 250 fifth grade students were presented flags and etiquette booklets. Eighty runners and walkers participated on this beautiful day. We wish to thank St. Mary's Medical Center for being our corporate sponsor. Lion Charlie Buzzard and Lion Judy Deer helped members of the Marshall University Lions Club recruit new members at a tableing at the Marshall University Student Center. 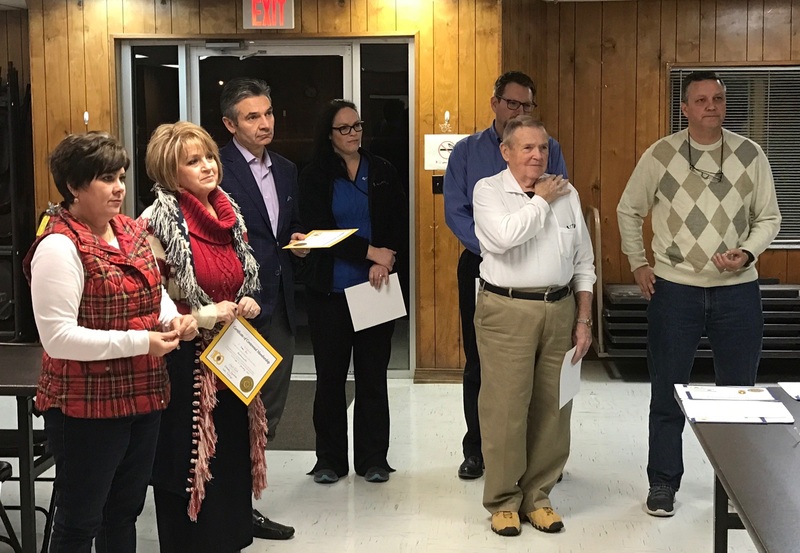 President Charlie Buzzard receives the Team Up To Warm Up Certificate of Appreciation from Zone Chair Lion LeeAnn Welch for our club participating in the coat drive sponsored by the Huntington Downtown Lions Club. Lion Charlie Buzzard presents a check for $250 to Marshall University Lions Club treasurer Shannon Dunn. As the sponsoring club we are providing this money as start-up funds. The Marshall University Lions Club will be having its charter night on Thursday, April 17, in room 333 of Corbly Hall located on the Marsahll Campus at the corner of 16th Street (Hal Greer Blvd) and 5th Avenue. Let's all show up that evening to support this club. You will have to pay a $10 fee to attend. Lion Bernie Hesson, our Tail Twister this year, has put a lot of life into our meetings. Past District Governor Lion Eddie Queen inducted Lion Steve Nash at our meeting on March 11, 2014. Lion Steve had dropped out of the club for about three years, but he is really glad to be back. Lion Charlie Buzzard is his sponsor. He pinned Lion Steve. 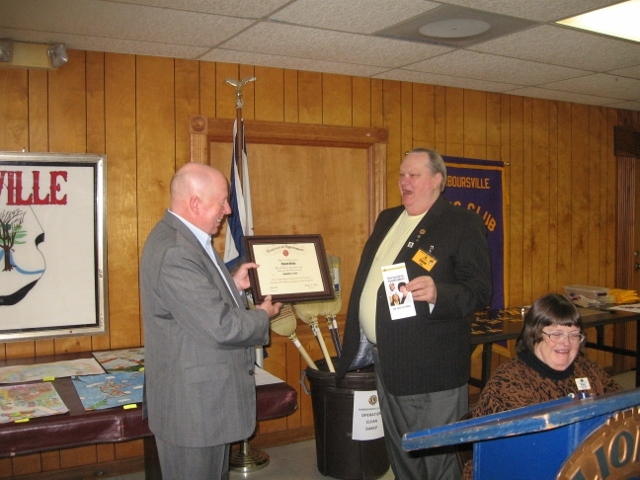 The Barboursville Lions Club, on behalf of their president, wishes to thank Lion Eddie for coming to induct Lion Steve. Lion Eddie was very glad to do this induction of his good friend. Lion Bernie Hesson passed out pancake tickets and posters to those who wanted to pre-sell the tickets prior to the breakfast on April 5, 2014. All 250 were distributed with Lion Lennie Roe taking the Lion's share. Go get 'em, Lion Lennie!!! Lion Julie Sheils agreed to get the names of principals and fifth grade teachers at the five elementary school where our club will be presenting American flags and etiquette booklets later this month. Treasurer Lion Renee' Burcham informed the club that St. Mary's Medical Center had sent the $3,000 as our corporate sponsor for the 5K Run/Walk to be held on April 19. Lion Renee', chair of the 5K, plans to make assignments for the event at our next meeting on March 25. President Charlie Buzzard presented a Leonard Jarrett Award to Lion Lib Ciccolella and Lion Larry Poynter of the Barboursville Lions Club. Lion Lib and Lion Larry are very deserving of this award named after Lion Leonard Jarrett, who was instrumental in getting the West Virginia Lions Sight Conservation Foundation started here in West Virginia (1959). It is the second highest award presented to Lions, with the highest award being the Melvin Jones Award, named after Melvin Jones, the founder of Lions Clubs International (1917). Time: Saturday, April 5, 7:00 a.m – 11:00 a.m.
Prospects will be invited to join us for a meal and an orientation about Lionism. When: Saturday, April 19 beginning at 9:00 a.m. The Barboursville Lions Club, serving the community for 71 years, invites anyone interested in serving their community with a great group of devoted Lions to come to one of our meetings. We meet on the second and fourth Tuesday of each month at the Barboursville Community Center, 721 Central Avenue, Barboursville, WV. Come share a meal with us. We meet at 6:30 pm.